The plumes we have selected to offer our customers are Handcrafted in the USA using only domestic feathers. This style uses dyed American turkey feathers. 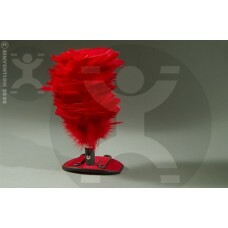 This is an 8" tall plume that incorporates a standard screw mount that works with our leather base (not included). This product offers you the option to add other colours of plumes to your Sinvention pony bridle. Ask us about custom colours and colour combinations. Does not include the black leather plume base cover or red interchangeable plume base as shown.